If this article and I mysteriously disappear from Facebook, after you have read this you will understand why. And I can always be found at my blog Vaults Of Karma, Tea Party Community, Patriots For America, Seen Life, or check with my partner on Facebook, Rick West. You may want to join or friend those now. 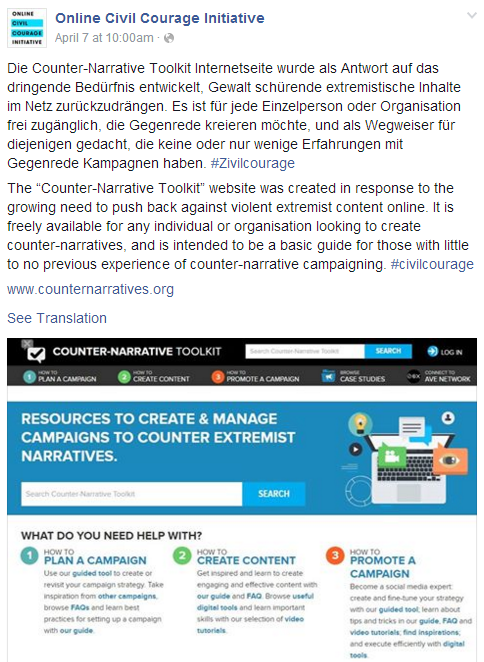 Recently in Germany, Facebook helped develop a campaign against “hate speech” called the “Online Civil Courage Initiative” (OCCI). Facebook’s COO Sheryl Sandberg launched the initiative this January in Berlin, along with the German Ministry of Justice and Consumer Protection among other independent NGOs from Germany and Europe designed to tackle radical and extreme speech. Facebook initially pledged more than $1 million to the campaign, which focused on helping organizations that are already tackling hate speech, building “best practices” for those groups, and researching the various sources of hate speech. Facebook is encouraging people to share stories and ideas on the official OCCI Facebook page by using the hashtag #civilcourage to show their support for the initiative. It is becoming crystal clear to an ever-awakening populace: Open-borders globalists and technocrats are actively using their power and influence to subvert and subdue the Will of the People across the world. Social media platforms, which serve as the most effective way to rapidly disseminate information, are cracking down on those of us who oppose the underlying agenda of these outlets. It has come to light that Mark Zuckerberg and Facebook are working to influence critical political issues and the 2016 presidential election by censoring pro-Trump accounts and supporters. I have had many removals, account limits and FB jail sentences myself, almost as many as I have friends. As long as I am still in existence on Facebook, you are welcome to please follow me HERE..
From left to right: Sasha Havlicek (Institute for Strategic Dialogue), Gerd Billen (State Secretary at the Federal Ministry of Justice and Consumer Protection), Sheryl Sandberg (Facebook), Peter Neumann (International Centre for the Study of Radicalization and Political Violence), Anetta Kahane (Amadeu Antonio Foundation). They have it in for the term Zionist. As their Moderators either don’t know or do know and don’t want it known that there is a difference between Zionists and Jews. That there are Christian Zionists as well. So they are either stupid in their moderation or they are trying to censor Anti Israel posts, about all their lies and Genocidal Actions.